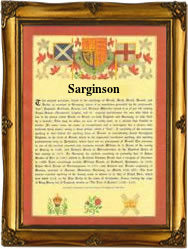 Recorded as Serjeantson, Sarginson, Sergison, and Sargison, this is a patronymic English surname of some antiquity. It was originally occupational for a sergent, an early Middle English word of a servant of some status within a royal or noble household. The surname was probably used in the general sense at first of a servant of higher rank than the 'downstairs' staff, but one that later developed various specialised meanings. These included a tenant who held the rank by service on behalf of the local lord of the manor. As such he would have been below the rank of a knight or a sheriff, but was a junior officer of the law charged with enforcing judgements of a court or tribunal, in other words, an early policeman. There has always been great variety in the spellings of this name as shown in the examples above. The first recorded spelling of the family name is shown to be that of William Serganton of Yorkshire in the Poll Tax rolls of theat County in 1379, whilst somewhat later Robert Sarginson, was christened on January 4th, 1600 at St. Dunstans in the East, Stepney. This was during the reign of Queen Elizabeth 1st =of England and known as "Good Queen Bess", 1558 - 1603. Surnames became necessary when governments introduced personal taxation. In England this was known as Poll Tax. Throughout the centuries, surnames in every country have continued to "develop" often leading to astonishing variants of the original spelling.